For the past two decades, the anti-Israel rhetoric of Mahmoud Abbas and the Palestinian leadership has radicalized many Palestinians, to a point where they are no longer willing to accept any form of compromise or peace with Israel. By accusing the Trump administration of hostility to the Palestinians, the Palestinian leadership has delegitimized the US to a degree where many Palestinians now feel that Americans are legitimate targets for violence and terror attacks. How, exactly, do these condemnations conform with Abbas's other claims that he seeks to resume peace talks with Israel? The mask on Abbas's face has fallen once again. That mask has, in fact, been falling for many years. Perhaps one day the world will even see that. Palestinian Authority (PA) President Mahmoud Abbas continues to say one thing to his people, and an entirely different thing to the international community. To Arab audiences, Abbas describes Israel and the US administration as not far short of Satan incarnate. When the PA president sends a message to the international community, however, he shows a different face. Ever since US President Donald Trump's December announcement recognizing Jerusalem as the capital of Israel, Abbas and his top aides in Ramallah have been consistently signaling to the Palestinians that the peace process with Israel is "over." The Palestinians have also been assured by Abbas that Israel and the US will pay dearly for the recognition. Abbas has promised, among other things, to revoke the PLO recognition of Israel, halt security coordination in the West Bank, and abrogate previous agreements signed between the Palestinians and Israel, beginning with the Oslo Accords. Two key decision-making bodies, the Fatah Central Council and the PLO Executive Committee, have recommended in recent weeks that the Palestinian leadership endorse these measures. Notably, Abbas chaired the meetings of the two bodies in Ramallah. The message emerging from the meetings of the Palestinian leaders in Ramallah is that the Palestinians will not "return" to the negotiating table with Israel and that the US administration is an enemy of all Palestinians. In addition, since Trump's announcement, Abbas and the Palestinian leadership have been waging a massive campaign against the US administration by denouncing it as one of the "most hostile" American governments against the Palestinians in modern history. One of Abbas's spokesmen, Nabil Abu Rudaineh, has repeatedly accused the Trump administration of "ignorance " and "incitement." These words come from the mouth of the very Palestinian Authority that has made anti-Israel incitement into its reason for being -- the heart and soul of its propaganda machine. Abbas and his cohorts are among the world's experts in the art of incitement and indoctrination. For the past two decades, their anti-Israel rhetoric has radicalized many Palestinians to a point where they are no longer willing to accept any form of compromise or peace with Israel. Now, Abbas and the Palestinian leadership are doing exactly the same to the US and its president. Recurring Palestinian attacks on Trump's Middle East envoys, David Friedman and Jason Greenblatt, have placed the Americans squarely alongside the Israelis as the mortal enemies of the Palestinians. It is no wonder, then, that Palestinian thugs attacked US consular officials who came to Bethlehem to discuss ways of helping the Palestinians in various fields. The assault, which took place in late January, is just one sign of growing anti-American sentiments on the Palestinian street. This hatred is fueled by the ongoing incitement against the US administration being waged by Abbas and many top Palestinian officials. It was only by chance that no one was hurt in the attack in the offices of the Bethlehem Chamber of Commerce. The Bethlehem incident is an indication of what awaits any US administration official who sets foot in Ramallah or any Palestinian city. If and when Greenblatt ever returns to Ramallah, he will be met with protests, demonstrators, shoes eggs, and possibly more. The Palestinian media, which is largely controlled by Abbas loyalists, is full of daily attacks (and abuse) against Trump and his administration officials. Here is how Palestinian tactics work: the same Palestinian Authority whose vicious anti-US rhetoric encourages violence and terrorism also "denounced" the assault on the consular mission in Bethlehem. Additionally, Abbas ordered his security forces briefly to detain the perpetrators, some of whom belong to his ruling Fatah faction. Not surprisingly, their detention drew sharp criticism from many Palestinians. The Bethlehem incident highlights the precise mechanism of Abbas's bloody propaganda machine, the same one that has for so long trained the minds of Palestinians to commit terrorist acts against Israel. Abbas's daily condemnations of Israel -- including false allegations that Jews are plotting to defile and destroy Islamic holy sites -- triggered a wave of stabbings and car ramming attacks against Israelis during the past two years -- a tactic copied by terrorists in Europe. 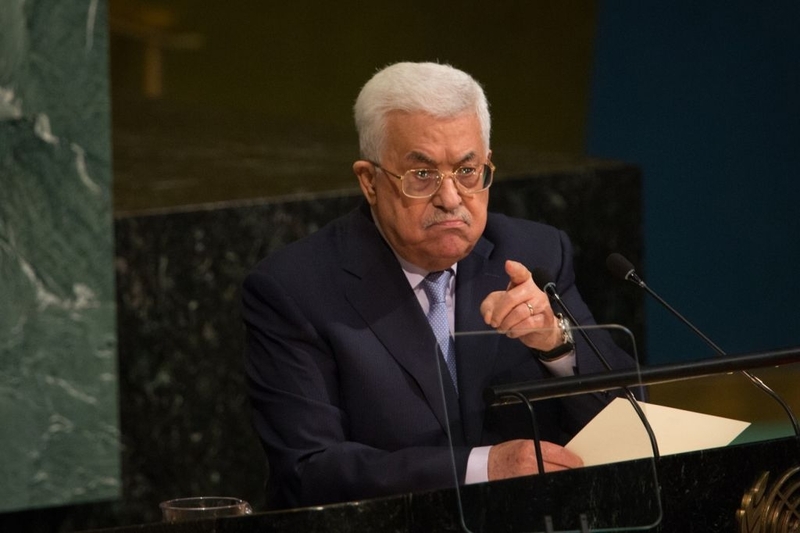 When Abbas faces the international community, however, he shows a different face. Suddenly, the same Abbas who has been telling his people that he will not "return" to the negotiating table and that he is even mulling revoking recognition of Israel sounds like a different person. During a joint press conference with visiting Indian Prime Minister Narendra Modi last week, Abbas contradicted himself, saying he had never refused to resume the peace process with Israel. "We are committed to the political process and negotiations," he announced. Abbas also declared that the Palestinians were committed to the "war on terrorism" -- depending, of course, on how one defines "terrorism." A reminder: This is the same Abbas who has been telling his people in the past few weeks that the peace process is finished. This is the same Abbas whose incendiary rhetoric against Israel and the US has driven Palestinians to violence and terrorism. Abbas is now telling the world that the US administration is no longer qualified to play the role of "honest broker" in any peace process between the Palestinians and Israel. He is also stating day and night that the time has come to replace the US role with an "international multilateral mechanism." Abbas presumably still hopes to be handed a Palestinian state. Former Secretary of State John Kerry recently advised Abbas to "hold on and be strong... stay strong in his spirit and play for time... and... not yield to President Trump's demands." While Abbas is seeking to eliminate any US role in the peace process, his envoy to Moscow, Abdel Hafiz Nofal, announced earlier this week that the Americans could still be part of an effort to solve the Israeli-Palestinian conflict. In other words, the Palestinians are willing to do the Americans a "favor" by "permitting" them to participate in efforts to achieve peace in the Middle East. It seems as if President Trump's threat to cut funding unless the Palestinians came to the peace table, had some effect. Even veteran Palestinian affairs experts admit that Abbas has managed to confuse everyone with his contradictory statements. Abbas mouths the word "peace," yet his Ministry of Information in Ramallah was the first to condemn a visit by Arab journalists to Israel. The nine journalists from Morocco, Lebanon, Iraq, Syria and Yemen were invited by the Israeli Foreign Ministry. But Abbas's ministry denounced the visit and called for blacklisting and punishing the Arab journalists for promoting "normalization" with Israel. How, exactly, do these condemnations conform with Abbas's other claims that he seeks to resume peace talks with Israel? The mask on Abbas's face has fallen once again. That mask has, in fact, been falling for many years. Perhaps one day the world will even see that. The real reason PA does not want any kind of peace with Israel is simple. PA fears failure after it gets the state it craves. Jordan fears a base that can radicalize Jordan and overthrow the regime. Moreover, once PA gets the state it craves, the huge corruptions will become clear and the consequence will be less support from the international body. Problem is that the West prefers to believe his lies. The guy is contradicting himself in every speech he gives but he get's away with it because the West prefers to be blind & deaf when it comes to their precious Palestinians......their secret weapon against the Jewish State. Bassam Tawil states, "The mask on Abbas's face has fallen once again. That mask has, in fact, been falling for many years. Perhaps one day the world will even see that." The problem is that "the world" doesn't want to see behind the mask. It's much easier and safer to accept Abbas's fake narrative than to admit the truth. Admitting the truth would result in accusations of, oh horror of horrors, Islamophobia. That must not be allowed to happen. And so "the world" continues to play along with Abbas's charade. Maybe, after Islamism takes over Europe and other parts of the Western World, people will be willing to admit the truth but by then it will be too late. It makes no difference what Abbas, or any of the other Palestinian "leaders" say, and anyone trying to make sense of it is wasting their time. The PA is not, and never has been, interested in peace with Israel. They keep up the fiction of negotiation to gain international legitimacy and keep the aid money flowing. The continuing "struggle" is what keeps them in power, and the indoctrination, propaganda, and incitement against Israel is necessary to give the public a direction and focus that allows Fatah, Hamas, etc. to rule. If their public was allowed to accept the existence of Israel, there would be no need for "resistance" organizations, and the public would probably not accept the continued rule of terrorists and thieves. Palestinians have been so thoroughly indoctrinated against Israel that they wouldn't tolerate a leadership that wanted to make peace. If there is ever to be peace, it will have to come through victory. Only a military solution that destroys the terrorist organizations will do. They will have to see that they're defeated, and accept that they have no other choice, before they are willing to recognize that Israel is not going to be theirs. The US and the rest of the civilized world has to wake up to the deception of Abbas. He is first and foremost a liar, telling his own people fabrications about both Israel and the US's intent to harm them. He also lies to and about the US, telling various creative stories to whomever he speaks. He should not be trusted in any endeavor and it would be best to ignore him completely. It is greatly to be hoped that the US stop any funding to the Palestinian authority. The money all goes into the pockets of Abbas and his henchmen and the populace sees none of it. Abbas's mask worked only for those willing not to see it. We all knew all along that Oslo was a boondoggle of major proportion legitimizing the illegitimate, fictitious nation calling itself "Palestinians" dedicated to the destruction of the Jewish state as declared openly in their charter. It is a plain and exact preparation for genocide as described in the UN law on genocide. This is the reason the PLO and it's multi personalities always multiplying have never been honestly part of any peace process because they exist for one reason and one reason only: The destruction of the Jewish state and replacing it with an Islamic state "from the river to the sea." Time to return the favor of 1948 when all the Jews were cleansed out of Yehouda and Shomron and cleanse out all of "The Palestinians" from the very heart land of the Jewish nation. No need to annex anything because this is part of the Jewish home land always has been and always should remain part of the Jewish home land.